As I have been writing about AdWords Enhanced Campaigns I have learned about a lot more than just the topic at hand. By using the tools of AdWords, analytics, and SEO plugins for Word Press (Yoast SEO Plugin), I have seen great improvements in the overall engagement with the website. Here is an outline of the strategy and tools I have used to help accomplish our engagement goals. 1. You have to begin somewhere. Perhaps an opening post introducing the concept of the topic. Then link to some resources you use to gain information on the topic yourself. It may not be great content yet, but you are just laying the foundation for better content in the future. Here’s the initial post on Enhanced Campaigns as an example. 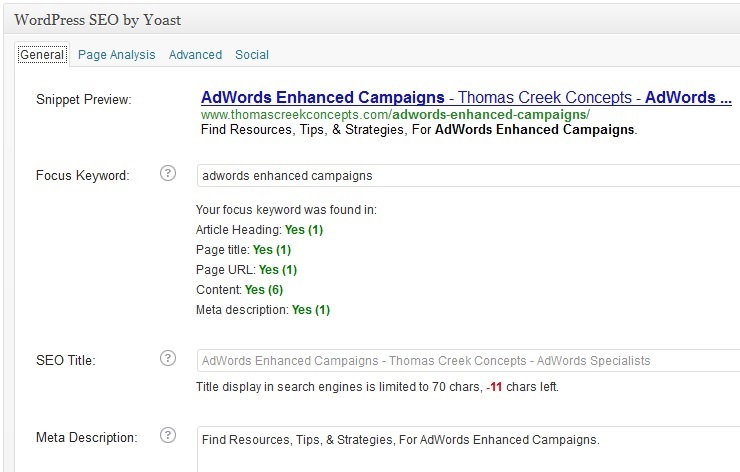 First AdWords Enhanced Campaigns post. 2. Use PPC advertising to find the keywords and ad content which resonates with your audience. Keywords – If the topic is ‘AdWords Enhanced Campaigns’, then use a few broad match variations of that KW, and analyze the search terms report data. At this stage, I am just looking for the search terms which have some impression volume. So, I sort by impressions to try and find any underlying search query terms that may have enough volume to actually show an ad. Once you have the search query data you have one piece of the puzzle – What in the minds of your audience is the “right” term to describe your content. Even though the term hasn’t gotten any clicks (perhaps due to the ads), if accruing impressions is my goal, ‘AdWords Enhanced Campaigns’ is in fact the “right” keyword. Ad Content – Try testing a few different messages with your PPC ads. What message resonates most? Learn more, buy now, get answers, etc. This is another piece of the puzzle that let’s you know who your audience is, and what kind of content they are looking for. These ads are tailored perhaps more to the SEM professional crowd looking to learn more about AdWords enhanced campaigns, than to a potential client who is looking for someone to manage their AdWords advertising. 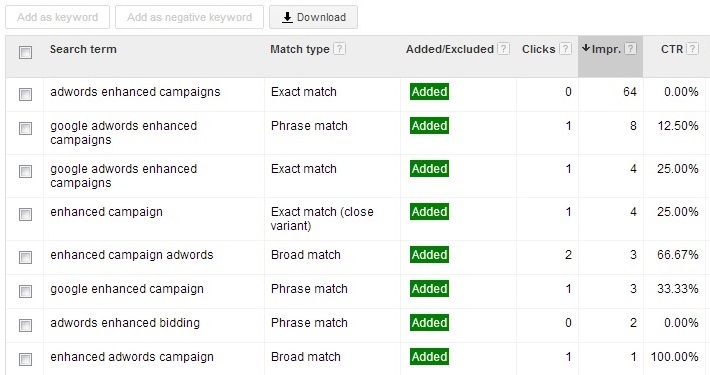 AdWords enhanced campaigns as of writing this are still pretty new. At this point, the goal of the content is to seek engagement with other SEM professionals to further discuss and analyze enhanced campaigns. In this case, the target persona is someone who is interested in learning and discussing tips and strategies. 2. Use the “best performing” KW (whatever metric you want, ex. impressions) as the focus KW for SEO, and the best performing ad text as the meta description. (Again, in this case I decided to go with the tips and strategies over the week one ad, because sooner or later the initial reaction to enhanced campaigns will wear off. There will however be continued updates on this topic, and the more long term, generic message is more likely to stay “fresh” over time.) You have used PPC data to immediately find what your audience is interested in. Now, use that information to improve SEO to get even more traffic in addition to your PPC advertising. 3. Now you have an audience, and you know what that audience is interested in. Make sure when creating new content to keep that information in mind. You are not just plugging keywords into a machine to try and win some kind of video game. 🙂 Your goal is to actually create content that someone, somewhere may find useful and engaging. By using all the tools at your disposal as part of a comprehensive content marketing strategy, you will be able to increase both traffic to and engagement with your website. As you can see above using these simple tactics over the course of less than a month, both page views increased, and bounce rate decreased. Granted these are not the only metrics of importance, or the only metrics which have improved. However, this is evidence that following a content marketing strategy which uses both PPC and SEO to improve engagement is not a difficult task. Any improvement is a good thing. Over time as you continue to use this approach, you are bound to learn ever more about your audience, and continue to create even more engaging content.